Knowing the right word at the right time is a great gift. But even the best of speakers has to admit that the best of his or her words are not nearly as good as those the Spirit gives. Nevertheless, we must not excuse ourselves for our insensitive speech, unkindness, or missed opportunities. Not paying attention to what was said is no excuse. Not being spiritually in tune with the needs of our companions is a cop out. Simply not knowing Scripture well enough to bless others with gracious speech at the appropriate time is self-deception. Listening to others after having listened to God in his Word is what tunes our ears and our hearts to bless others. Loving Shepherd, I will spend much of my time today with people. Some of them know you, but most do not. Please give me wisdom to say things that lead people closer to you. Give me words of help and hope for the broken. Give me words of tenderness for the fainting. Give me words of direction for the confused. 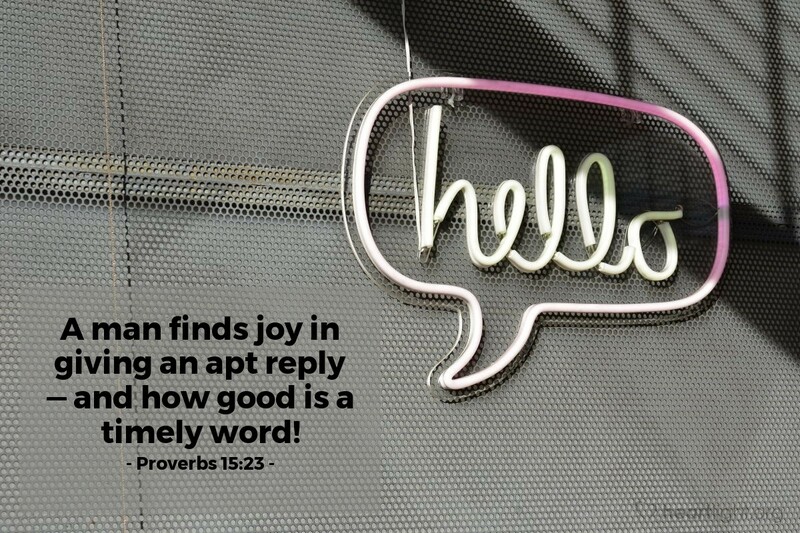 Father, I pray that whatever words I do say today may reflect your will and may be led by your purposes to bless others. In Jesus’ name I pray. Amen.